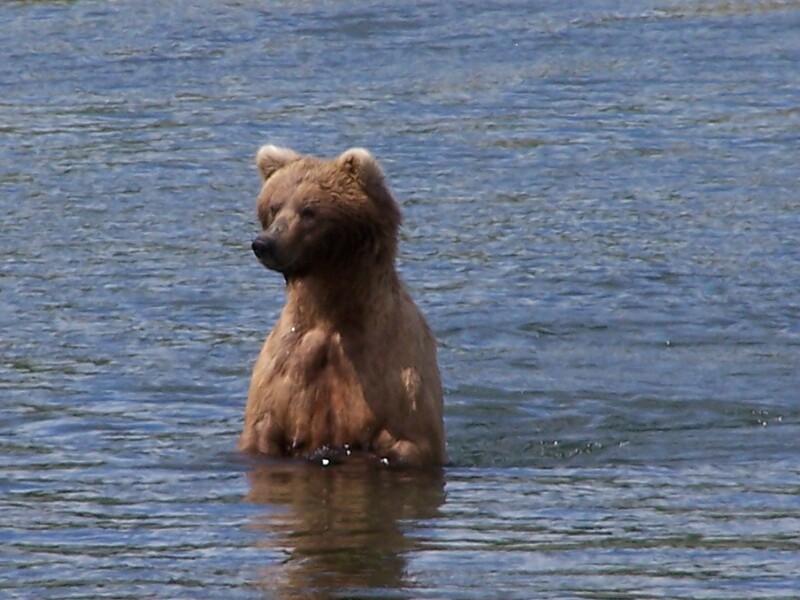 We are in the incredible Katmai National Park in Alaska, home to many brown bears (also called grizzly bears.) We wait for the bear to move along, which she does. As we wait, our guide catches up to us. She doesn’t have a gun; she has no intention of hurting the animal. Here, we are the trespassers. The Park Rangers gave us our lesson about bear safety when a float plane landed us on the beach at this magical place. This included the bear song. Make noise. You don’t want to surprise a bear. We keep singing and hiking. When there is a break in the trees, I see the fantastic view of the Valley of 10,000 Smokes. 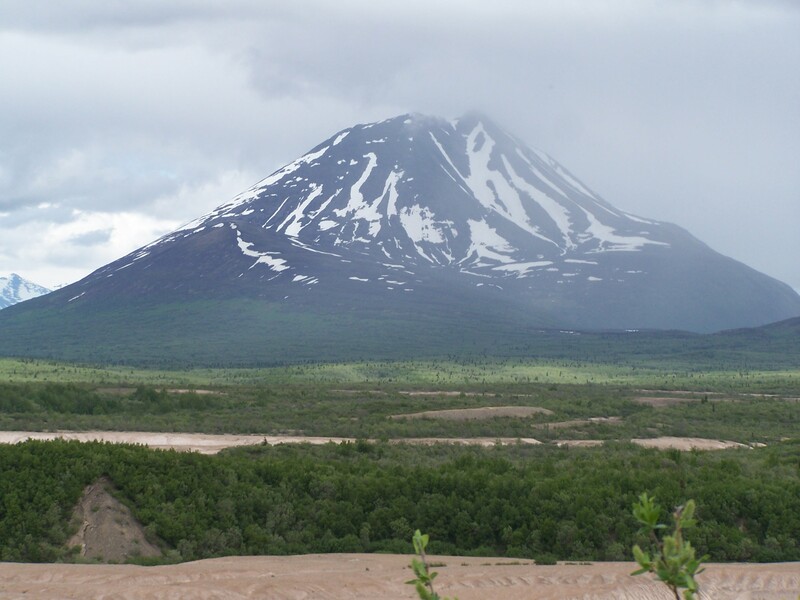 A volcanic eruption in 1912 created ash deposits as high as 700 feet. The wind blew the ash into columns, cliffs and beautiful formations that solidified over the years. We make another turn as we head back up the trail away from the valley, and the bear is standing there again. Her cub stands close to her, leaning against her leg, watching us. The mother is unconcerned. She eats the vegetation on the ground and rubs against a tree trunk. The guide unclips her bear spray, which can be unleashed from 50 feet away, just in case. We wait some more. The bear starts in our direction and we all back up without turning around. She goes off the trail and heads down. She’ll probably meet up with the trail again at the next switchback. 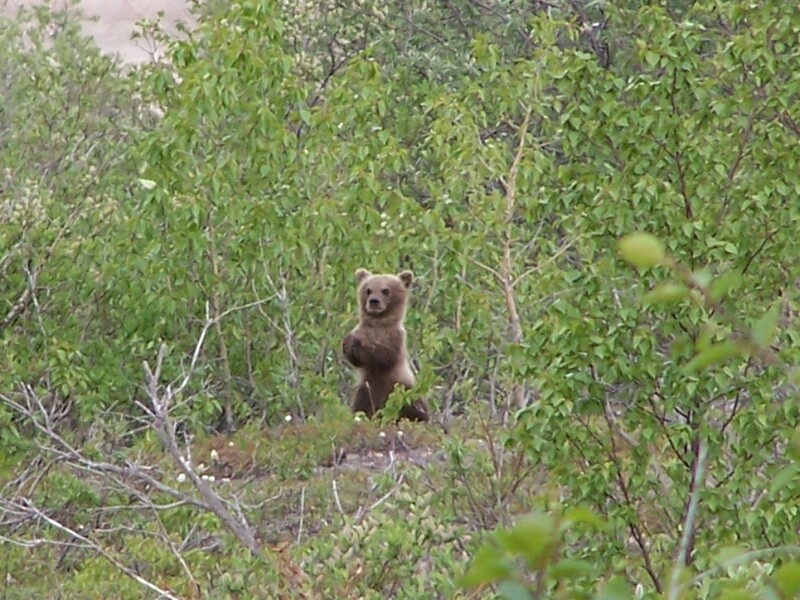 Bears are not dumb, like us they would rather follow a trail than bushwhack, too! We give a small sigh of relief. We have conflicting thoughts. It’s nice not worrying about the bear, it’s great seeing her, but we really don’t want her to go. We continue our climb until we get to a small clearing. We stop to enjoy the views. The sun is shining. The lupines color the hills in purple. We are covered in bug spray, so the infamous Alaskan mosquitoes aren’t too bad. The not-too-warm temperature is perfect for a hike. We grab a drink of water. 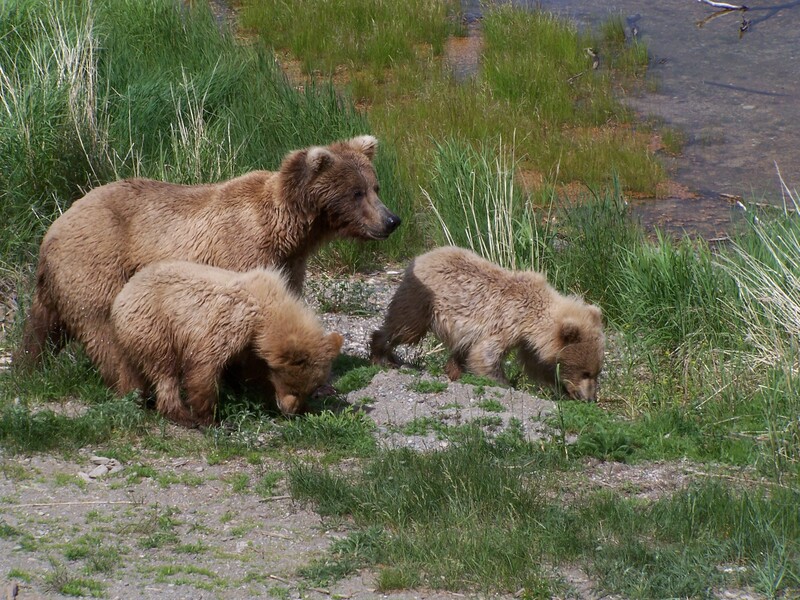 No snacks are allowed as that would tempt bears to come too close to you and your backpack – not even gum! 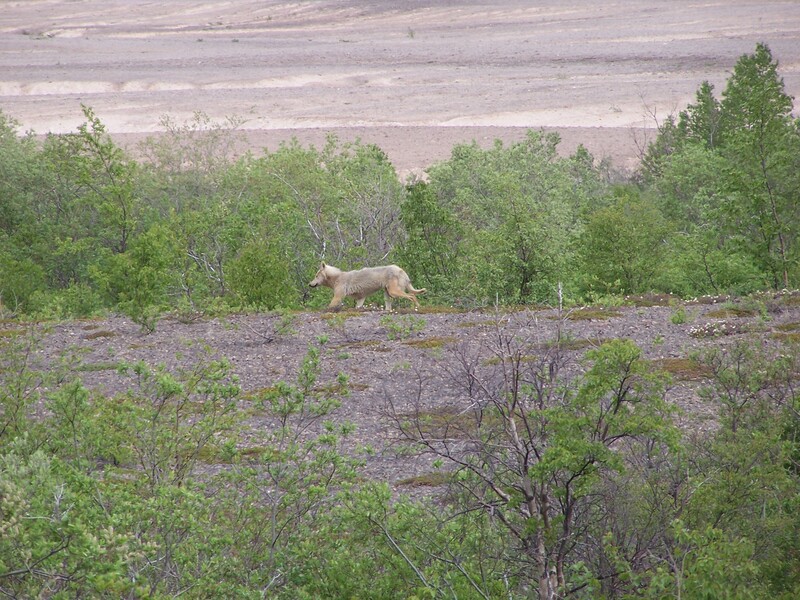 Suddenly six gray wolves trot across the clearing right in from of us. They are maybe twenty yards away, watching us while they move past. Gone as quickly as they appear, our Guide is jubilant at the rare sighting. Most everyone is fumbling for their cameras, in shock. Rachel is fast, though. She got a picture! 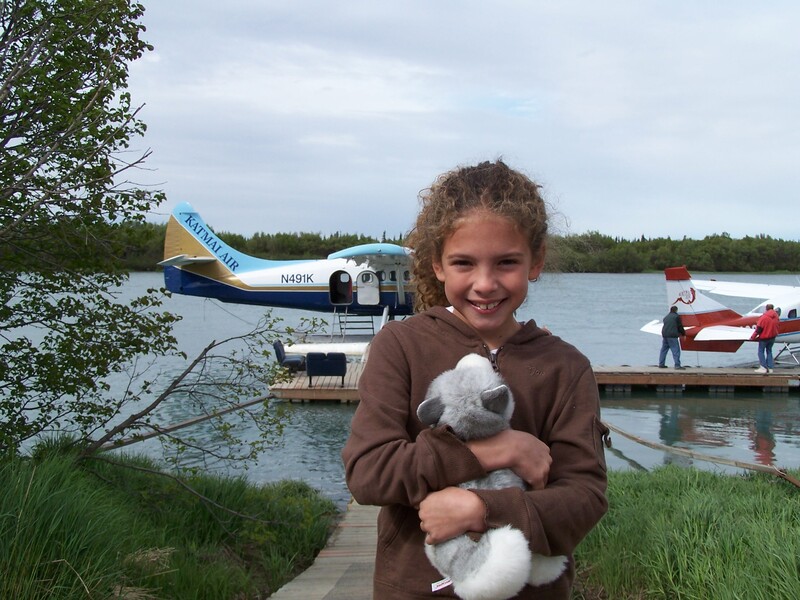 Courage Level: 2 – Everything, from the float plane to the bears, is more exciting than scary. 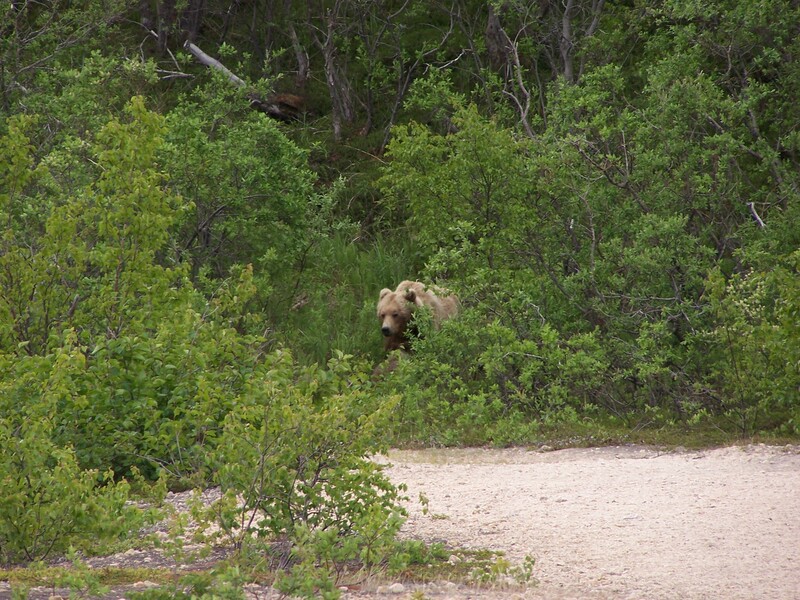 Yes, being on a trail with a huge bear can be intimidating, but you actually get used to it quickly here! 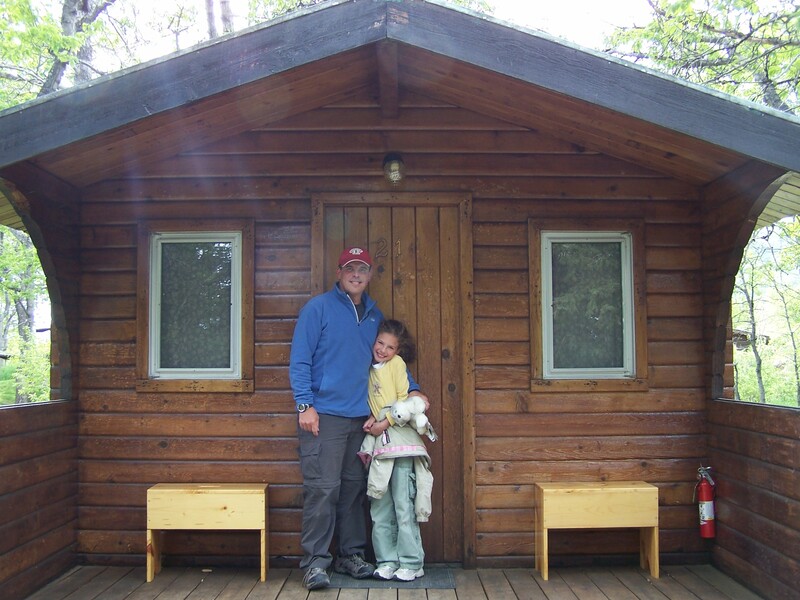 The cabins for sleeping are very secure and the Park Rangers give very detailed information about safety. 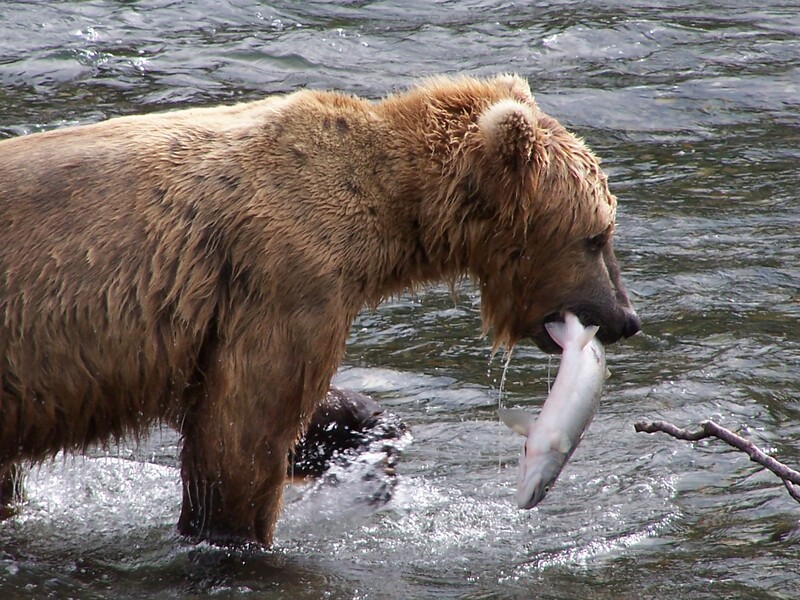 There has never been a bear attack in Katmai National Park. Fitness Level: 2 – As long as you are capable of hiking, this trip will be pleasurable. You don’t have to worry about overheating or high altitudes. My parents did this same trip in their 70’s (they are very active) and they loved it. Brooks Lodge gives you a list of things to bring. This is a “pack light” kind of trip. Your bag is weighed before getting on the float plane and it can’t weigh too much. As with everywhere in Alaska, it’s all about layers for clothes. A base layer of wicking fabric, maybe short sleeve like you would wear to the gym. Then a light-weight but warmer layer on top. My husband likes fleece. I have a thin down jacket from North Face I like. We have very cheap poncho style rain gear that fold very small. We take them everywhere when we travel because we can fit 3 of them in a day pack with lots of other gear. They can also fit over backpacks to keep them dry and if you sit down they can cover your legs. They cost about $5 at Wal-Mart and have been all over the world with us. Hiking boots are a must. We all have different brands with no particular loyalty. Bring binoculars, whichever ones you have that are small enough to carry around, but powerful. You need bug spray with Deet. You can spray it on your clothes. We had socks and pants with bug spray built in. These are expensive items, but if you are going to be traveling to places with lots of bugs, it’s worth it. We used them in the Amazon as well. Also, bring a hat and a mosquito net for your head. On hikes or when at the falls watching the bears, it keeps bugs from flying around your face, which is annoying! You can get these things at REI, EMS, LL Bean and many other stores. For a camera, we use the Stylus Tough by Olympus. We use it because it is shock proof and water proof. We do not want to worry about a camera or lug around a huge camera bag. We are on our trips for the experience, not photography. This is not the camera for a real photographer. It’s point and shoot, which is why we like it. We are always moving too fast for anything else. It takes great memory photos, though! Any more info I need? 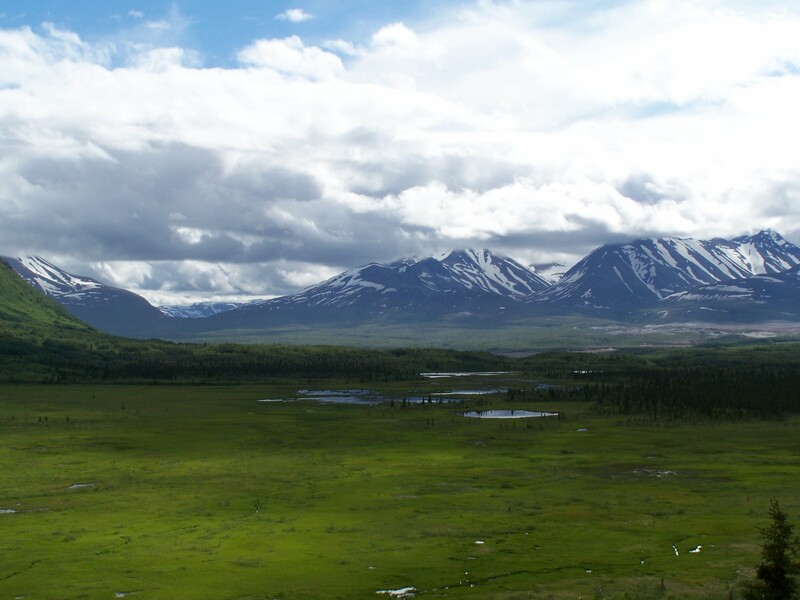 If, like us, you are spending a fair amount of time in Alaska exploring (and you should!) then you need a place to stay in Anchorage. You also need a place to store the rest of your bags. We stayed at two places that were nice. 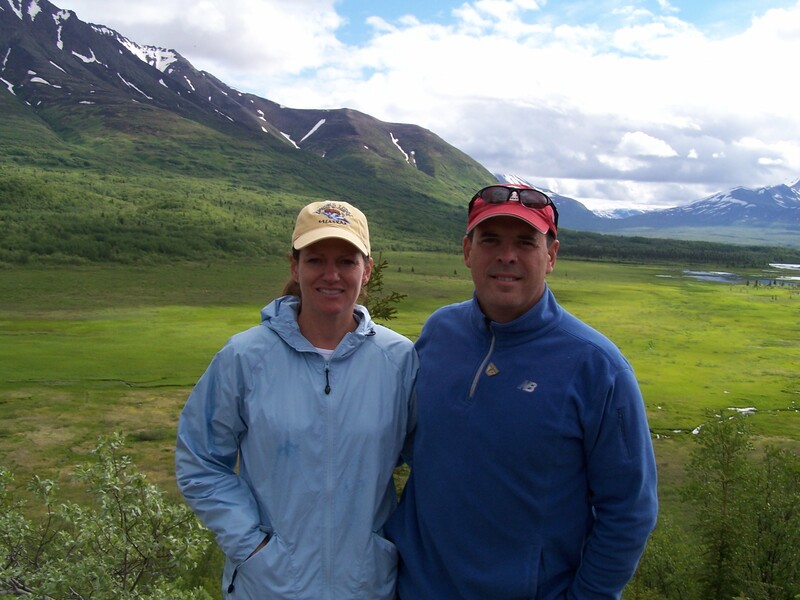 They are owned by the same people, and both are bed and breakfasts, which is what we prefer. The first was early on in our trip. http://www.alaska-wildflower-inn.com/index.html It was very nice, great location, delicious food. The second place, http://www.arcticfoxinn.com/ we stayed at the night before and the night after our trip to Katmai. Our room was more like an apartment, but it also included breakfast. It was a slightly longer walk, but was still close enough to downtown. The food was really good here as well. We got to eat reindeer sausage, which was cool! 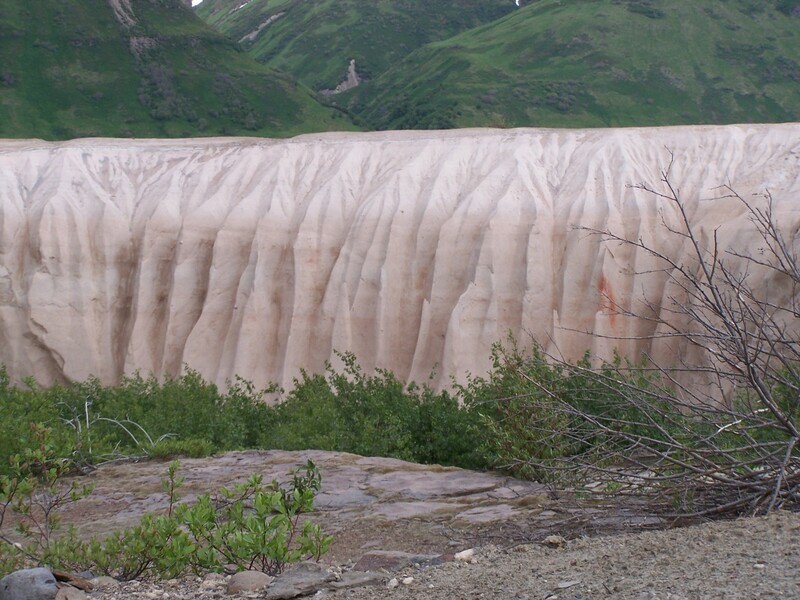 We were able to leave our bags there while in Katmai. You can read about both places on TripAdvisor. You can also watch the “bear cam” that they have set up. You can watch for bears you recognize.